A professional digital film camera that combines the incredible image quality of URSA Mini 4.6K with the features and controls of a traditional broadcast camera! 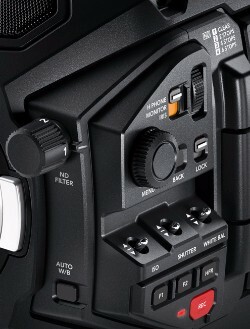 You get a massive number of ergonomically designed controls on the side of the camera so you can adjust most settings by feel, and without ever having to take your eyes off the action. URSA Mini Pro also features built in ND filters, a status display and a revolutionary new interchangeable lens mount that lets you change between EF photographic lenses or PL and B4 lenses. URSA Mini Pro records up to 60fps and features dual C-Fast 2.0 recorders as well as dual UHS-II SD Card recorders. URSA Mini Pro is lightweight and comfortable enough to use all day, has controls that are extremely fast to use, and image quality that’s far superior to broadcast cameras costing ten times more! URSA Mini Pro features high quality neutral density (ND) filters that let you quickly reduce the amount of light entering the camera. The 2, 4 and 6 stop filters have been specifically designed to match the colorimetry and color science of URSA Mini Pro, providing you with additional latitude, even under harsh lighting conditions. This lets you use different combinations of aperture and shutter angle to achieve shallower depth of field, or specific levels of motion blur, in a wider range of situations. The IR filters have been designed to filter both optical wave lengths and IR wave lengths evenly to eliminate IR contamination of the images that most ND filters can suffer from. The ND filters are true optical filters with a precision mechanism that quickly moves them into place when the ND filter dial is turned. The filter settings can even be displayed as either an ND number, stop reduction or fraction on the LCD! Compatible with EF, PL and B4 lenses! Different projects require different lenses, which is why URSA Mini Pro features a new interchangeable lens mount! Imagine shooting regular work using a photography lens but then being able to change to a PL mount cinema lens if you get a high end film job. URSA Mini Pro makes that easy because you can quickly switch between EF, PL and B4 lenses, making it compatible with the widest possible range of professional lenses. That means you can work with high quality EF photographic lenses, large PL cinema lenses, and even B4 broadcast lenses, all with the same camera! URSA Mini Pro comes with an EF mount and you can purchase optional PL and B4 lens mounts separately. With URSA Mini Pro, you get a single camera that works with virtually all professional lenses so you can choose precisely the lens you need!